The Humane Party, a political party in the United States, has published the final, full draft of the Abolition Amendment, a proposed amendment to the United States Constitution. 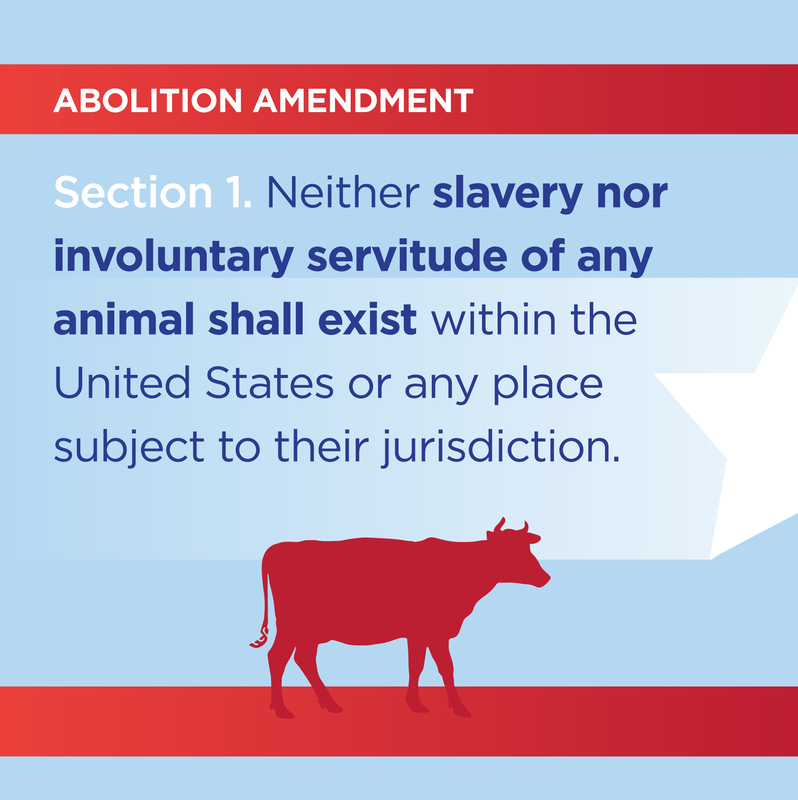 Upon ratification, the Abolition Amendment will abolish the property status of all animals under U.S. jurisdiction, thereby bringing an immediate end to the meat, dairy, egg, poultry, fish, leather, fur, vivisection, rodeo, and other violence-based industries. The text of the Abolition Amendment includes five sections. The first section extends the protections of the 13th Amendment to other animals. The second and third sections address legal mechanisms – such as habeas corpus and guardian ad litem – for enforcing animal’s rights. The fourth section provides a framework for a updating the definition of the word “animal” while also establishing clear boundaries for such modification. The fifth section, similar to the final section of other Constitutional amendments, empowers Congress to implement additional legislation in furtherance of the substantive provisions of the article. Publication of the final draft of the Abolition Amendment coincides with the second annual celebration of Abolition Day, a national celebration created by the Humane Party so as both to commemorate ratification of the 13th Amendment—which ended human slavery—on December 6, 1865, and to promote ratification of the Abolition Amendment—which will end all slavery. Finalization of the text of the Abolition Amendment follows closing of the last of six public-comment windows, during which windows the public at large submitted comments, concerns, and suggestions regarding the text of prior drafts. The first of these periods for criticism and commentary began on December 25, 2015. After expiration of each public-comment period, the text of the Abolition Amendment was revised in light of feedback received and then resubmitted for public scrutiny, until the last public-comment period ended on November 24, 2016. The Abolition Amendment marks a turning-point for the animal rights movement in the U.S. by providing a common, concrete, articulated goal around which ethical vegans, animal protection advocates, environmentalists, and social justice activists from all walks of life can unite. Anyone can support the Abolition Amendment, regardless of personal background, ideological viewpoint, or political affiliation. The full text of the Abolition Amendment is available through social media (facebook.com/abolitionamendment) as well as through a website (abolitionamendment.wordpress.com) for the U.S. abolition movement. Promotional materials and additional background materials are also available through these resources. Launched in 2009, the Humane Party is the U.S.’s first political party committed to rights for all animals—not just the human kind. All Humane Party officers, board members, and candidates must be vegan personally and abolitionist politically. Learn more about the Humane Party through its website (www.humaneparty.org) and social media page (facebook.com/humaneparty).